I’m back in the black! I finished the Sisters Choice variation that was on the design wall back in October….seems like just last month. This one looks so much better in person, I don’t have a good place to display or hang a quilt to get a good picture. 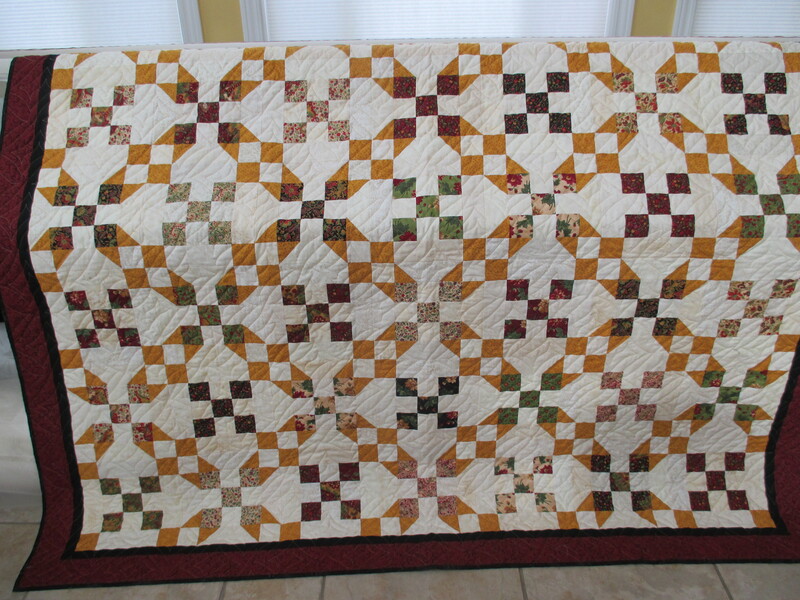 The quilt finished at just under 68 X 78, quilted quickly with Keryn Emmerson’s Square Spiral pantograph. The Missouri Star Quilt Company (aka MO* or MSQC) sent another Charm Pack this week so I have something to add in this week also. I’m getting quite a nice collection of Charms. I see a nickel quilt in my future. Used year to date 7 1/6 yards…I don’t like odd fractions so I’m thinking this should be rounded or maybe I’ll switch to decimals. Go check out more stash reports at Judy’s. The Sister’s Choice setting is really interesting. Sister’s Choice is my favorite block. Good job on the Sister’s Choice! I’m wishing we had a close up shot or two to see the fabrics/quilting a little better, but it is so mellow and lovely! I like how the border seems to contain the blocks, keeps them from exploding out into the universe – that was my first thought when I saw your quilt. I think it is a great quilt and congrats on the finish. Very pretty quilt and a good start to the year. I’ll bet it looks lovely on a bed.